As I accept this award I must note the rules ( this goes for all who receive this award as well ) . You must thank the person who awarded you by linking back to their post, you have to say 7 things about yourself and last but not least, you have to pass the award down to 15 other new or newly discovered blogs . 7. I love to try out new recipes from books I bought to the dismay of the Piggies clan :p Wild Boar famos line " Why can't you stick to your own recipe that the kids like to eat ? " 6. I love to crap nonsence lately to the dismay of my readers :P I have just started another new blog to crap on things that make me happy besides food - My Knick Knacks So , if my post doesn't make sense at all...please excuse Elin - she has succumbed to the ageing factor ! 2. I can save on anything but not on food , kitchen accessories and cookbooks. I love them and that is my only weakness ! I can stay away from all temptations but not those lovely cookbooks and kitchen accessories. Wild Boar know that and my Piggies know that. You can guess what I get from them each year for my birthdays and Mother's Day ! 1. I talk with my two dogs everyday without fail and my neighbor thinks I am mad or overly romantic for I coo and call them ' Baby and Darling ' ( WB asked why I never coo and call him Baby and darling) So I told him this " coz you are not a dog :p you are a wild boar "
Congrats on your award! My husband is appalled that I coo at my pup too. They are like little babies, how could you not coo? Congrats! You really are a versatile blogger! I've recently made your kimchi and will be posting it soon and, of course, give you the honorable mention. Hi Elin-Loved reading your cute, and funny post about talking to your two dogs...I also talk to Lora's two little doggies, and to my son's, and of course to my two kitties. We have a perfect understanding, and as a matter of fact my cats, practically have a conversation with me...so funny! 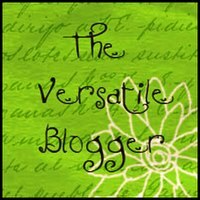 Congratulations on the Versatile blogger award...well deserved. So sweet of you to pass it on to me, as well. Thank you, it's such an honor! Thanks so much Elin ! We've never gotten an award before. This looks like a lot of fun ! Thanks again ! Thank you for thinking of me...that was very sweet.